Daily Illuminator: Munchkin And MIBs In Geek Culture! January 9, 2016: Munchkin And MIBs In Geek Culture! Steve Jackson Games has garnered a mention in the book Geek Culture by Kate Norlander (@KateNorlander)! 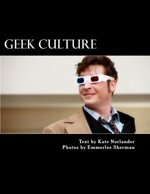 The book focuses on CONvergence, a Minnesota sci-fi and fantasy convention, and celebrates a variety of geek cultures, including gaming. Our very own MIB volunteers and Munchkin are mentioned in the final chapter, something we're always proud to see! If you're interested in checking out Geek Culture, you can get it at Amazon or CreateSpace.